Hello All Sparkler Lovers! Welcome to our first installment of Sparklers DIY. 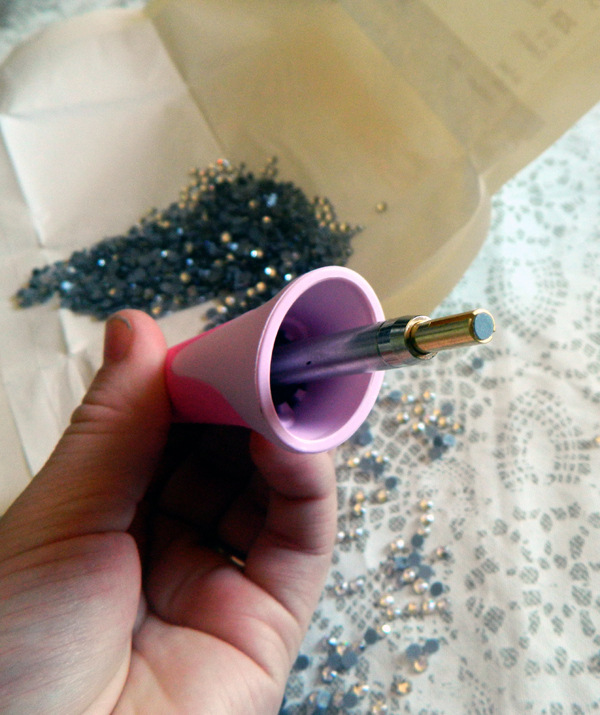 This DIY is bejeweler heavy, so get out your magic wand and power it up! Enjoy! I grabbed a package of 10 gross or 1440 pieces. 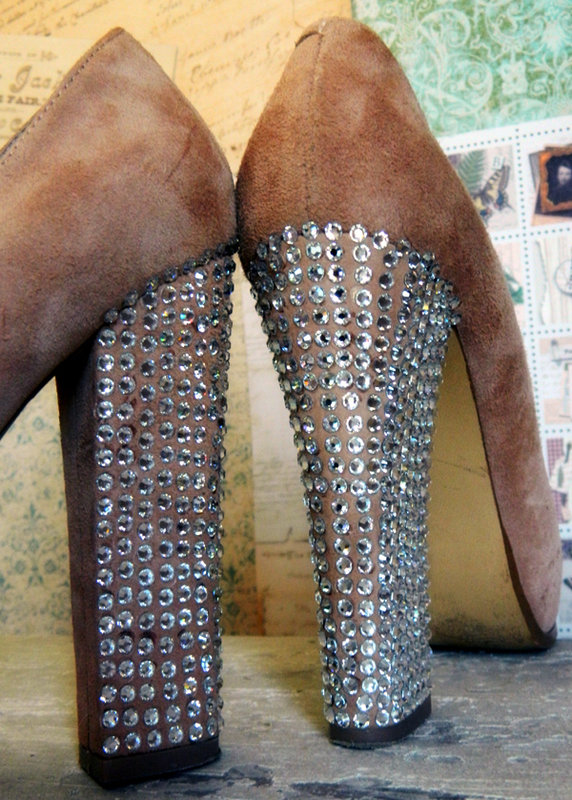 You do use a lot of crystal on heels. Size 16ss or 4mm is the best size to start with. Not to big and not to small. Then you need a pair of suede or fabric heels. It needs to be a porous material so the glue has something to hold on to. Slick leather is a no go. 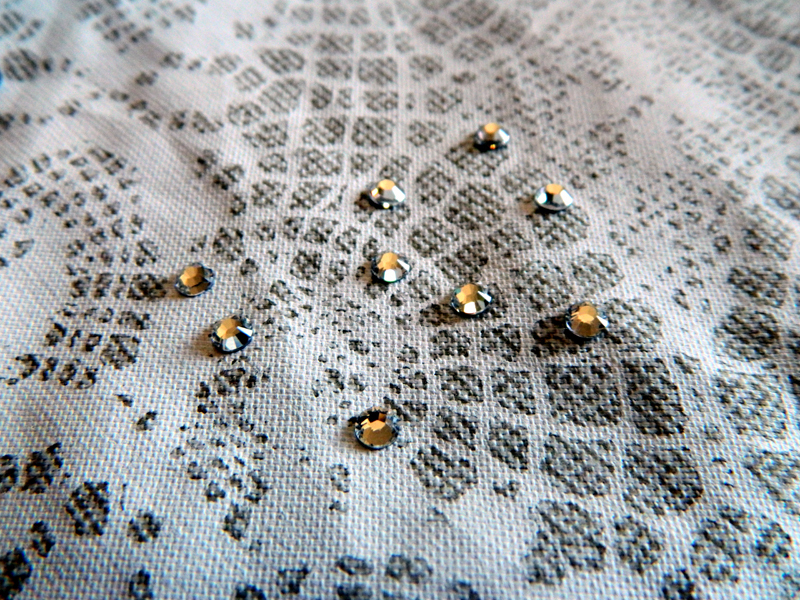 Oh Swarovski… you are so pretty! See the gray back? 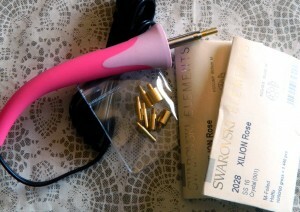 That is the hot fix glue, which makes it work with the Bejeweler Heat Setter Tool. 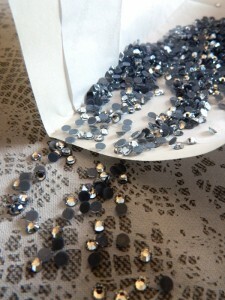 Sooooo much easier then applying glue to each crystal & much less mess. Lay out all of your crystals sparkly side up. Work on a hard flat surface, a wood cutting board works great. Make sure the right tip is screwed into the Bejeweler, it is inscribed on the side of each tip. Plug your Bejeweler in and give it a few minutes to get nice and hot. To pick up the crystal, very gently place the Bejeweler tip directly on top of the crystal. Do not push down hard. Hold it there for a few seconds, the heat causes the crystal to expand slightly, and the tip will hold the stone. Pick up the crystal and look at it. This is key. You are watching the back side, the glue, melt. It should bubble slightly and glisten. For a size 16ss or 4mm crystal it takes about 5-8 seconds for it to melt completely. Gently touch the tip to where you want the crystal. 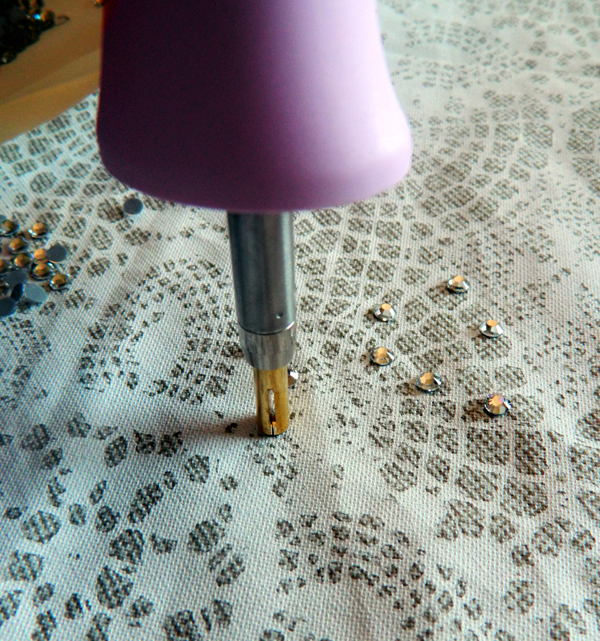 The hot glue will pull the crystal out of the Bejeweler tip and set itself on to the fabric. I will give it a little extra by pushing the crystal on to the fabric to make sure it has a very secure hold. Be very careful! It is hot! Band-aide maybe? Tip: If the crystal gets stuck in the tip, have a push pin in hand. Slide it into the slot on the tip and gently pull the crystal out. See the slots on the tip in the picture above? Very convenient. Wha-La!! That is how you use the Bejeweler. Just repeat, repeat and repeat until you have covered what you want or you run out of crystals 🙂 Hope you get addicted to blinging, just like I have! Soon you will start thinking everything you own will look so much better with a little crystal here and there. Thank you for stopping by and we hope you have a Sparkly Day!